Leverkusen, 24th May 2017. In a strict AMS braking test TMD Friction once again proofed the high quality of Textar Aftermarket brake pads. The car is loaded up to the permissible gross vehicle weight with two people and weights for the test. The car is brought to a standstill by braking from a speed of 100 km/h ten times in a row. The first and the tenth braking application are evaluated to provide information about the characteristics of the brake pads when they are cold and when they are hot. The internationally accepted AMS test was originally developed by the automobile magazine “auto motor sport”. TMD Friction performed the test within the scope of their benchmark series in order to secure und expand the high quality and performance of their products based on the results gained. In the current test Textar competed against three competitors and the respective OEM material, with which both test vehicles (Audi A5 and VW Passat Variant) were equipped with ex works. 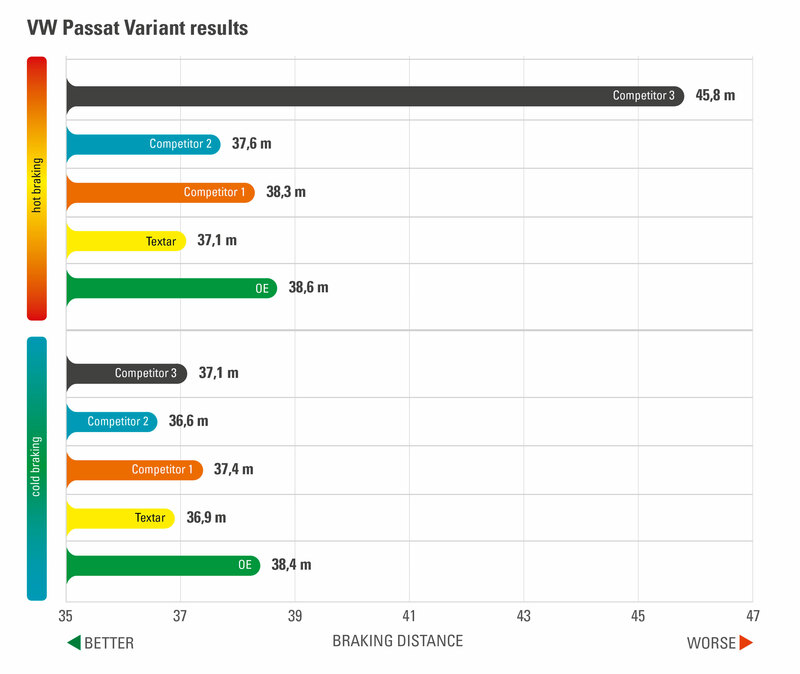 Overall, Textar achieved the best results compared to the competitor’s products and scores even better results (VW Passat Variant) than the OEM material. competitor is 2.8 m. For cold braking Textar brake pads and all three competitors achieve even better results than the OEM material. For hot braking nearly every brake pad except a single one beat the OEM pad in terms of braking distance. 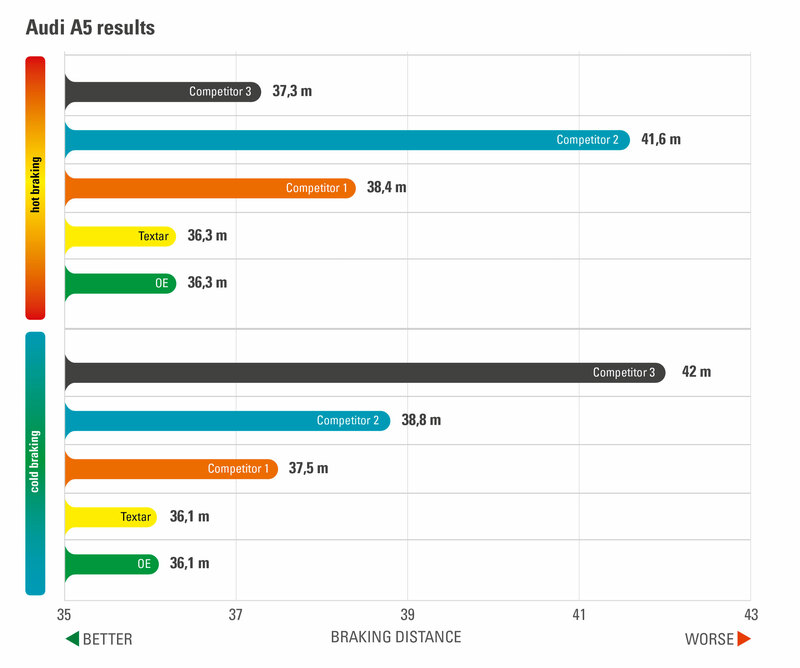 Textar is the supplier with the lowest deviation between the first and tenth braking application: Only 0.2m, compared to a competitor with 8.7m which corresponds to two vehicle lengths. “Today, in a time of high-tech, high performance cars and increasing traffic brakes have to generate maximum performance with speeds up to 250 kilometers per hour”, states Vincenzo Di Caro, Product Engineer of TMD Friction. “Significant testing cycles are very important to us in order to check and improve our products. The AMS test shows as one of many examples the great importance of safety for Textar. Moreover, it clears up with prejudices because it shows that Aftermarket brake pads can be even better than OE products when we deal with original spare parts. The car is loaded up to the permissible gross vehicle weight with two people and weights for the test. The car is brought to a standstill by braking from a speed of 100 km/h ten times in a row. Overall Textar achieved the best results compared to all three competitors und even better results than the OEM material. Photos: Copyright TMD Friction, 2017. Reproduction permitted free of charge provided source is cited. Please send us a specimen copy. TMD Friction is one of the world’s leading manufacturers of brake friction materials to the automotive and brake industry. The company’s product portfolio comprises disc brake pads and drum brake linings for passenger cars and commercial vehicles together with friction materials for racing and industrial applications. With its brands Textar, Mintex, Don, Pagid and Cobreq, TMD Friction has a market-leading position in the global replacement parts market. Under the brand names Cosid and Dynotherm TMD Friction develops and produces friction materials for industrial applications. TMD Friction has four operations in Germany as well as in Europe, USA, Brazil, Mexico, China, Japan and South Africa. The TMD Friction Group employs approximately 4,800 people worldwide. For further information please visit www.tmdfriction.com.